Abby Schnable | The Phoenix The Loyola men's basketball team walks off the court after falling to Creighton in the NIT March 19. 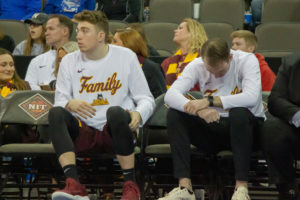 Abby Schnable | The Phoenix Loyola walk-ons Will Alcock and Dylan Boehm react to the Ramblers' season-ending loss to Creighton March 19. Abby Schnable | The Phoenix Loyola guard Marques Townes looks for an open teammate against Creighton March 19. Abby Schnable | The Phoenix Loyola guard Clayton Custer fends off a Creighton defender March 19. After failing to make the NCAA Tournament, No. 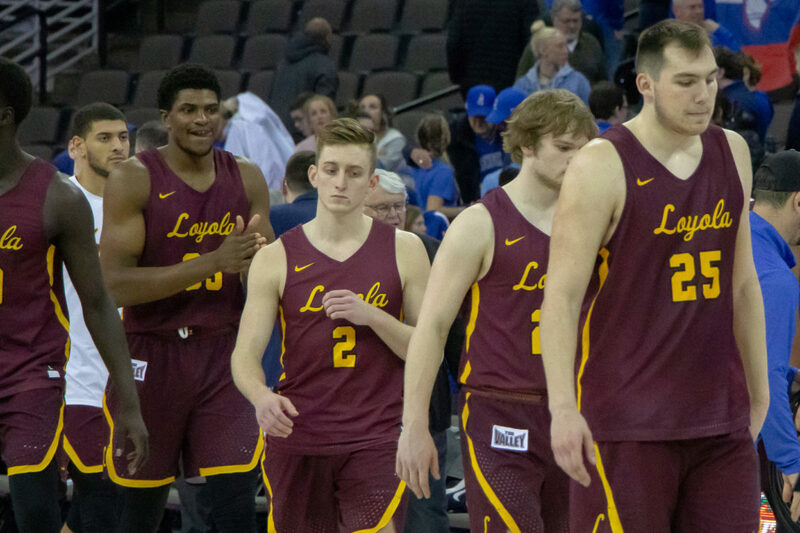 7 seed Loyola (20-14) saw its season come to an end with a 70-61 loss to No. 2 seed Creighton University in Omaha, Nebraska in the first round of the National Invitation Tournament Tuesday night. Redshirt sophomore forward Aher Uguak led Loyola with 18 points on 9-for-11 shooting — one point shy of his career high. 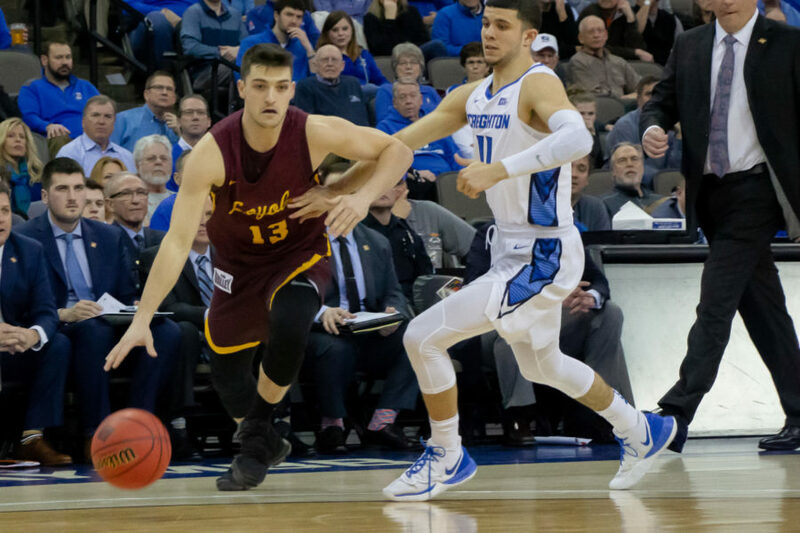 The only other Loyola player who scored in double figures was sophomore center Cameron Krutwig, who put up 17 points, four rebounds and five assists. 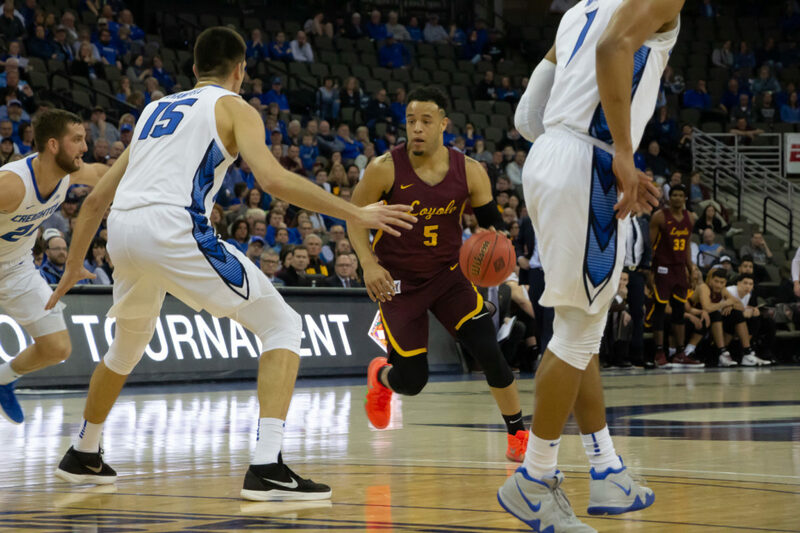 Once Creighton’s lead was finally out of reach, Loyola head coach Porter Moser took out Marques Townes and Clayton Custer for the last time in their Loyola careers with 15 seconds left in the game. Both redshirt senior guards shared an emotional embrace with Moser and then one-by-one, hugged every player and coach on Loyola’s bench. Following the loss, a teary-eyed Moser put into perspective the career accomplishments of Townes and Custer and what the pair meant to Loyola. Abby Schnable | The Phoenix Loyola redshirt senior guard Clayton Custer drives to the basket against Creighton in the NIT March 19. Townes — the Missouri Valley Conference (MVC) Player of the Year — only managed to score two points while dishing out eight assists. The redshirt senior guard scored a combined 11 points on 4-of-25 shooting in his finals two games at Loyola — both losses. As a group, the Ramblers shot 47 percent from the field, including going 5-for-14 from three-point distance. The Bluejays shot 49 percent, but went 9-for-25 from downtown to seal the victory. 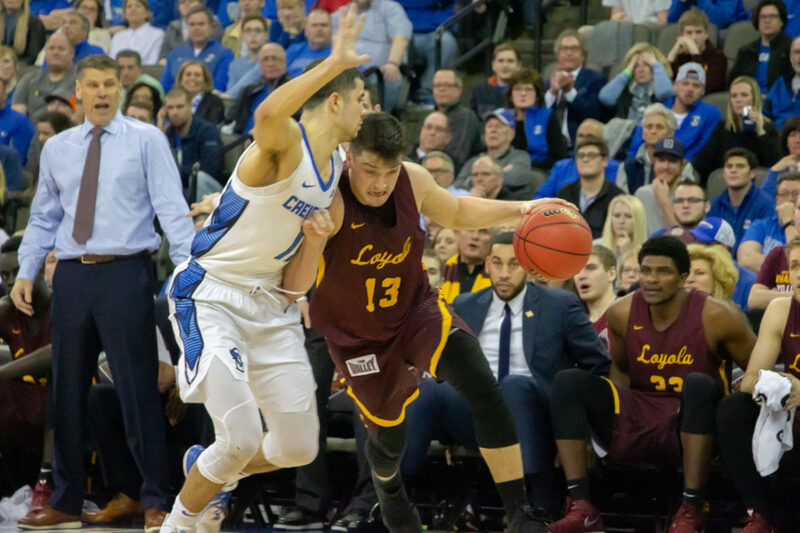 Loyola found success on offense through passing by dishing out 20 assists, which was considerably more than the Ramblers’ season average of 13.8 per game. Custer scored nine points and had four assists in his final game in a Loyola jersey. However, the former MVC Player of the Year struggled in the second half, scoring three points on 1-of-5 shooting. Moser said losing Townes and Custer will be tough, both on the court and in the locker room. However, Moser brought up Krutwig — who was sitting next to Moser in the press conference — as a future leader on the team. The Ramblers are slated to return eight scholarship players next year, including Krutwig, Uguak and sophomore guard Lucas Williamson. Opening night for the 2019-20 season is scheduled for Nov. 5, according to the NCAA.